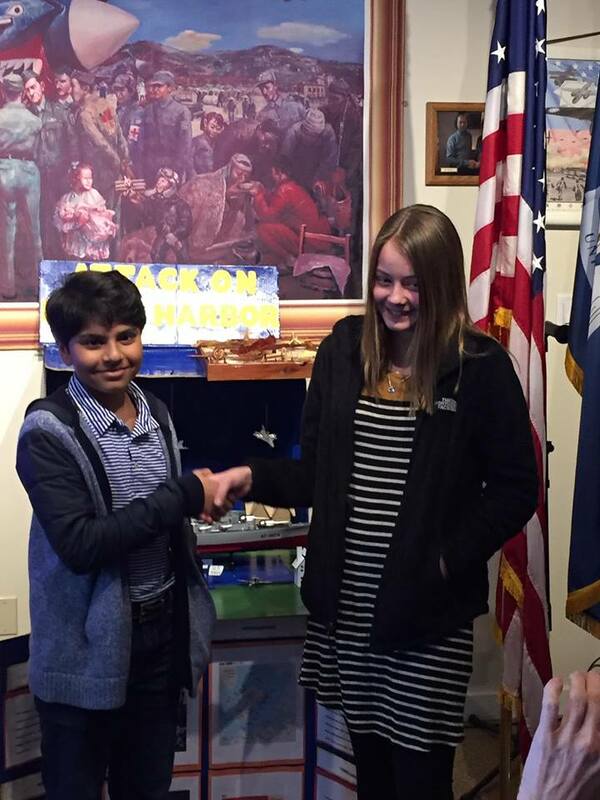 On March 25, 2017, The National WWII Museum hosted its Greater New Orleans National History Day regional contest: the last of five regional contests to determine which students move on to the Louisiana History Day State Contest to be held on Saturday, April 8 at The National WWII Museum. 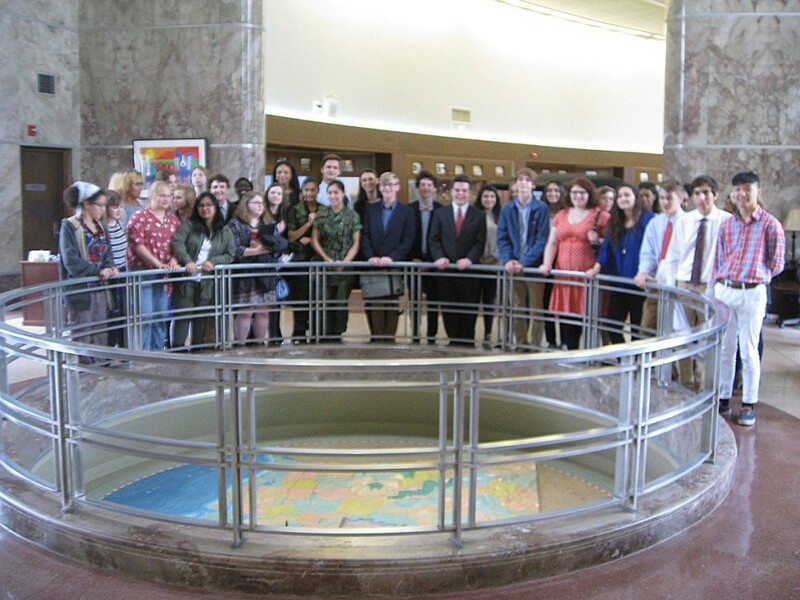 National History Day is a nationwide student research competition in which students, grades 6 – 12, either as individuals or in groups, conduct research and construct a project on a historical topic of their choice. 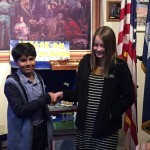 Projects in this year’s contest focused on the theme of “Taking A Stand In History” with student-selected topics ranging from Muhammad Ali’s protest of the Vietnam War to First Lady Betty Ford’s fight to raise awareness about the dangers of alcoholism and substance abuse. At this year’s Greater New Orleans regional contest, over 250 middle and high school students with over 100 projects in 18 different categories competed throughout the day for a chance to advance their work to the State Contest, where they will not be competing solely with local students, but also with the winning students advanced from the Lafayette, Monroe, Shreveport and Baton Rouge regional contests as well. 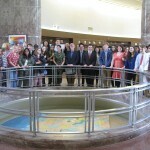 The winners from the Louisiana History Day State competition will then travel on to represent the state of Louisiana at the NHD National Contest held each year in June in Washington D.C..
For these students, the regional contest is an important step and the result of many months of researching, writing and perfecting their work. 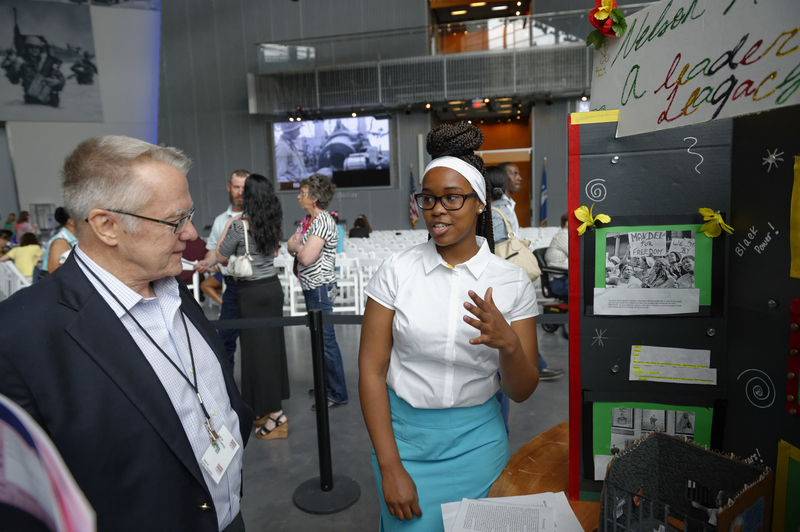 As the state sponsor for National History Day in Louisiana, The National WWII Museum congratulates all the winners and all the students in Louisiana who participated in our contests! Last autumn my neighbors were having a birthday party in their front yard. The highlight of the decorations was a bundle of helium-filled mylar balloons. It was windy, and they worked themselves free. I was working in my yard, and looked over when I heard sounds of dismay, and I watched the balloons slowly drift towards the power pole across the street. The balloons contacted the transformer, there was a very loud bang, and all the lights on our block went out. In England during WWII they had barrage balloons along the coast and over cities and military installations. 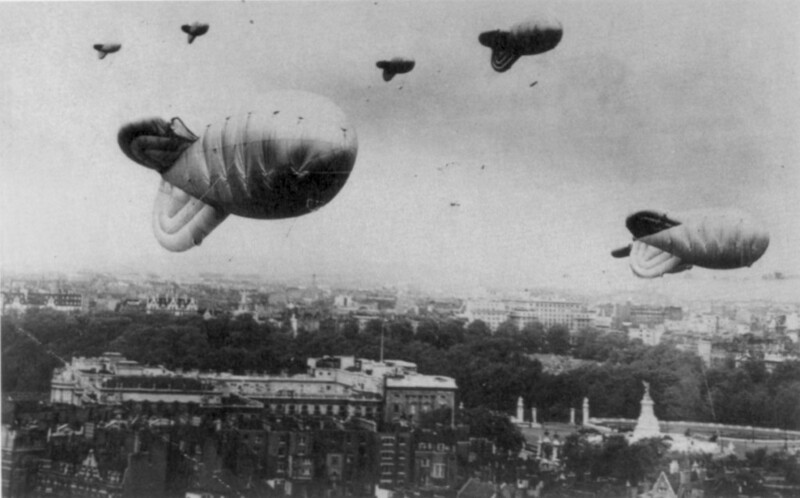 They were large, tethered blimps, designed to make enemy aerial navigation difficult by placing obstacles in the way. Their long cables threatened to entangle encroaching aircraft. The barrage balloons occasionally broke loose, like the mylar balloons I witnessed. 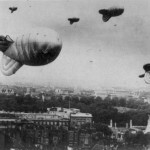 But the defensive blimps, being anchored by heavy metal cables, caused much worse damage to electrical infrastructure. In September of 1940 a large storm knocked loose a number of barrage balloons, which glided across the North Sea and caused considerable damage to power lines and radio antennas in Denmark and Sweden. 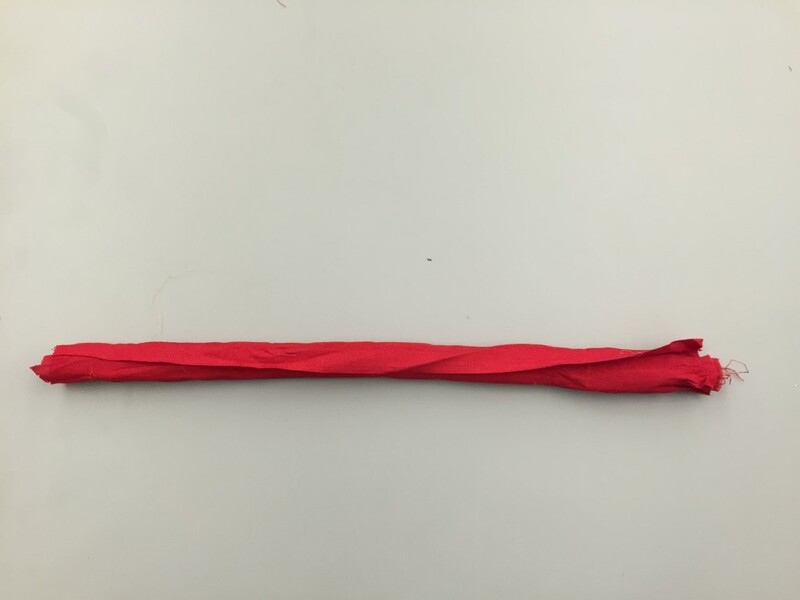 After that, Churchill ordered that the possibility of using ballons like these as weapons be investigated. The Royal Air Force responded with a negative report, believing it to be too costly at a low likelihood of effect. The Navy responded enthusiastically. Winds at high altitudes (>15,000 feet) tend to move from East to West over the North Sea and Europe, so the conditions were favorable, and the Royal Navy had a surplus of 100,000 weather balloons. Tests were conducted, and plans made. These balloons were designed to be inflated to 8 ft in diameter. At launch a slow burning fuse was lit, and the balloons ascended rapidly, stopping at 25,000 ft as an internal band stopped further expansion. As the hydrogen used to inflate the balloons slowly leaked away they descended. The fuse would eventually release a small opening in a bucket of mineral oil, and as it leaked away the balloon descended faster. About half the balloons carried a wire payload. The same fuse that released the mineral oil would also release a coil of wire held by hemp rope to the balloon. The balloon was calculated to maintain an altitude of at least 1,000 feet so that it would keep moving (below that the air can become very calm). In theory, the wire could short circuit high voltage lines, or break transformers. The other half the balloons carried an incendiary payload. This was either cans of incendiary jelly, bottles of phosphorus grenades, or canvas tubes filled with explosive and fuses. These were all designed to create small fires. These also were items already on hand and easily and cheaply made. There is a kind of genius in turning an accident, with knowledge, existing supplies, and some creativity, into a weapon. In the latter half of 1942 the British launched between 1,000 and 1,800 balloons a day from a golf course in Felixstowe and a bay near Dover. All releases were clustered over 3 or 4 hours of a given day. Over 99,000 balloons were launched, and caused a great deal of havoc, confusion, and cost for the Germans. The biggest impact was from a balloon that hit a power line near Leipzig, and caused a fire that burned down the electrical station. Launches were suspended during Allied bombing raids, for fear they would interfere with aircraft. In mid 1944, because of the great frequency of bombing raids, the release schedule was changed to single releases every 10 minutes during daylight hours. The last balloon was launched in September of 1944. Barrage balloons defending London during WWII. 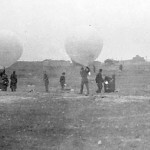 Release of weather balloons with offensive payloads from Felixstowe, some time between 1942 and 1944. March Classroom of the Month — Get In the Scrap! Each month the Museum will feature a standout classroom participating in Get in the Scrap!. Get in the Scrap! is a national service learning project about recycling and energy conservation, inspired by the scrapping efforts of students during World War II. Each featured class does stellar work to make a difference in their school, home, community and even the planet! For March, we’re featuring students from the Monroe Elementary group in Enid, Oklahoma, who are using Get in the Scrap! to help learn more about kids like them and their role in WWII. The students and their teacher, Amanda Purdy, sat down to answer a few questions for us about their work with Get in the Scrap! Monroe Elementary students proudly display their recycling box. This is just one of the many amazing classrooms participating in the Get in the Scrap! national service learning project. You can learn more and sign up your classroom today at getinthescrap.org! Thursday, March 16th, 2017 | Tags : Get in the Scrap! 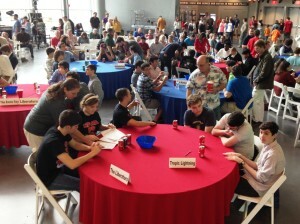 Teams from 23 high schools competed in the Museum’s 13th annual WWII Quiz Bowl on Saturday, March 11. Teams from 23 high schools competed in The National WWII Museum’s 13th annual WWII Quiz Bowl on Saturday, March 11, with the St. Thomas High School Chindits of Houston and the Jesuit High School Enola Jays of New Orleans emerging as finalists. Congratulations to all who participated! The finals will be televised live by Cox Communications at 6:00 p.m. March 30 on YurView (Channel 4 in New Orleans). The action will also stream live everywhere at YurView.com. 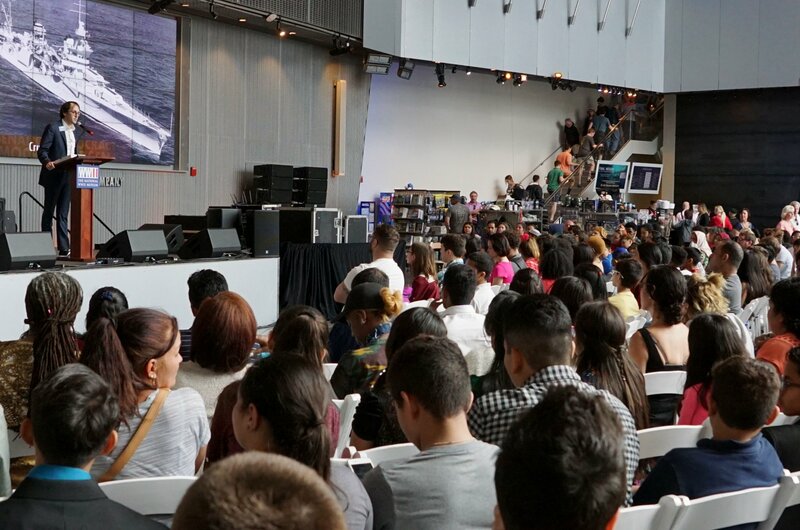 Follow the Museum on Twitter (@WWIIMuseum) to receive start-time prompts. YurView replays of the March 11 event have aired in New Orleans, Baton Rouge, and Lafayette, Louisiana; Roanoke, Virginia; Pensacola, Florida; and Fort Smith, Arkansas; among other markets. To find the live stream, visit the above address and enter “Quiz Bowl” in the search box. There, at 6 p.m. Thursday, you’ll find the St. Thomas High School Chindits of Houston and the Jesuit High School Enola Jays of New Orleans battling for the crown of 2017 WWII Quiz Bowl champs. Good luck to both teams! The WWII Quiz Bowl is sponsored by The New Orleans Advocate. 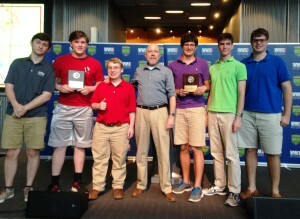 Quiz Bowl finalists: Tyler McStravick, Nate Belcher, and Nicholas Kurzy of St. Thomas High School; quizmaster and Museum Director of Education Kenneth Hoffman; Matthew Granier, Ethan Lagrand, and Preston Warwick of Jesuit High School. Watch the 2016 finals here. February Classroom of the Month— Get in the Scrap! Each month the Museum will feature a standout classroom participating in Get in the Scrap! Get in the Scrap! is a national service learning project about recycling and energy conservation, inspired by the scrapping efforts of students during World War II. 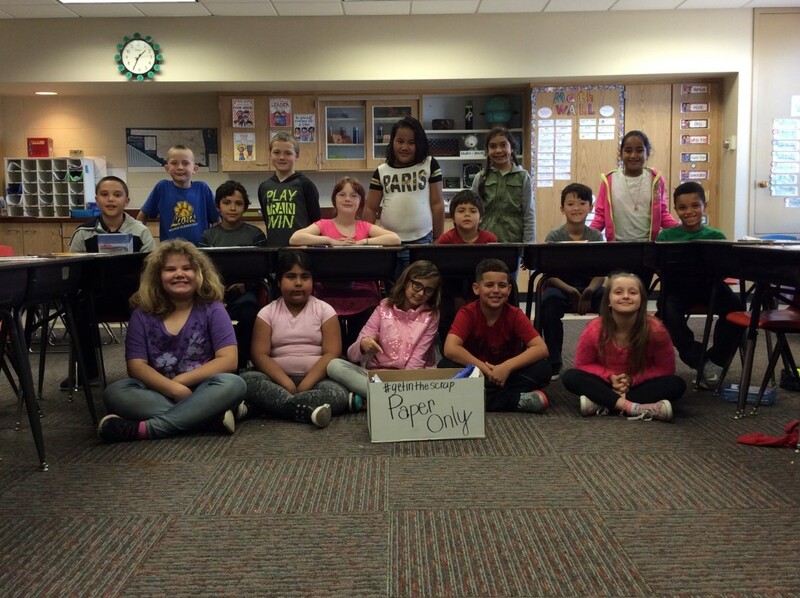 Each featured class does stellar work to make a difference in their school, home, community and even the planet! 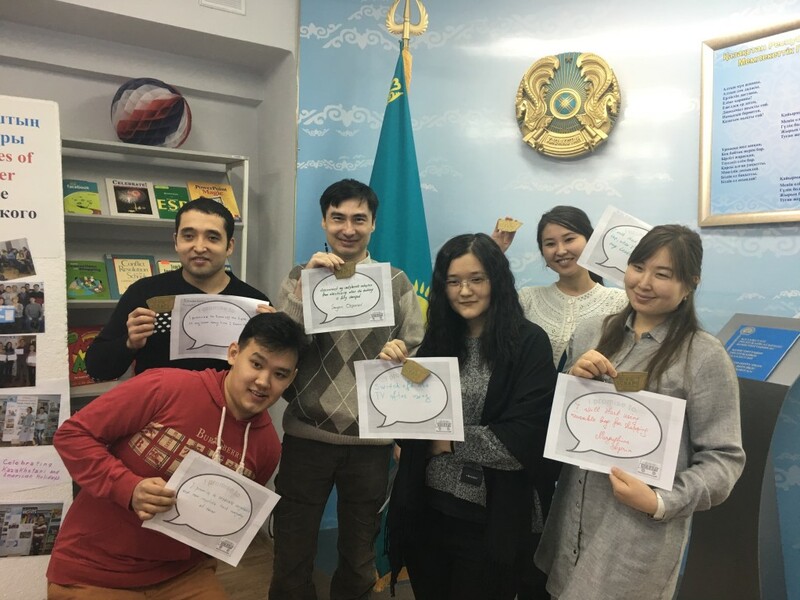 For February, we’re featuring students at American Corner Karaganda group who are using Get in the Scrap! to help learn English in Kazakhstan. The students and their teacher, Taryn U’Halie, sat down to answer a few questions for us about their work with Get in the Scrap! The American Corner Karaganda group with their 25 point prize — a Get in the Scrap! refrigerator magnet. Students also proudly display their Quote Promise Pix. Thursday, February 23rd, 2017 | Tags : Get in the Scrap! JS Hey died on 27 February of 2000, at the age of 81. Born in Lancashire, England, he was the third son of a cotton manufacturer. He entered University of Manchester and got his degree in physics in 1930, and a masters in x-ray crystallography in 1931. Hey taught physics at schools in Northern England until 1942, when he joined the Army Operational Research Group. We was assigned to work on radar jamming. At that point the Allies were using a form of radar with relatively long waves. Axis forces could not only detect this radar, but jam it. Using radar jamming two German warships had recently escaped through the English Channel. At the same time the Allies were losing an unsustainable tonnage of cargo to U-Boats in the Atlantic. 75 years ago this month Hey was monitoring radar jamming when he noticed a great deal of noise in the 4-8 m jamming Allied radar sets. Following the source, he noticed that it moved slowly, tracking the sun. Looking up meteorological data, he discovered that the Sun had a very active solar spot that day. 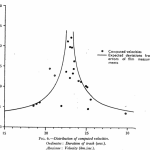 Solar spots had been hypothesized to produce streams of ions and magnetic fields. Hey interpreted the phenomenon of the radar jamming as support of this hypothesis. Development of radar using much shorter waves generated by the cavity magnetron allowed the Allies to avoid jamming by the Axis powers. Using this microwave radar Hey was tracking V2 rockets heading towards London in 1945 when he noticed transient radar echoes at about 60 miles of altitude. The echoes arrived at a rate of 5-10 per hour and persisted after the V2s were gone. 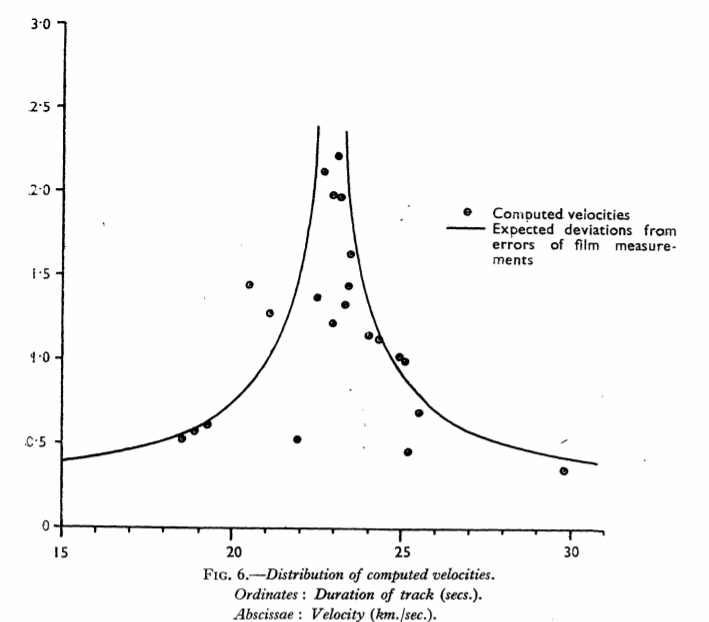 It turned out the echoes were the vapor trails of meteors, and Hey showed that meteors could be tracked this way in the day when they were not visible to the eye. JS Hey was not able to publish his results until after the war, for security reasons. Shortly after the war he was appointed to head the Army Operational Research Group, and he worked at the Royal Radar Establishment, where he continued his work in radio astronomy. 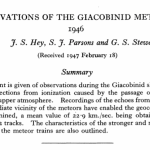 Hey published his results on tracking meteors and sunspots with radio waves after the war was over. “A Girl Scout is ready to help out wherever she is needed. Willingness to serve is not enough; you must know how to do the job well, even in an emergency”. Perhaps that explanation and the year in which it was stated can be attributed to how the Girl Scouts along with the rest of America had just endured World War II and the attitude on the Home Front that was necessary. 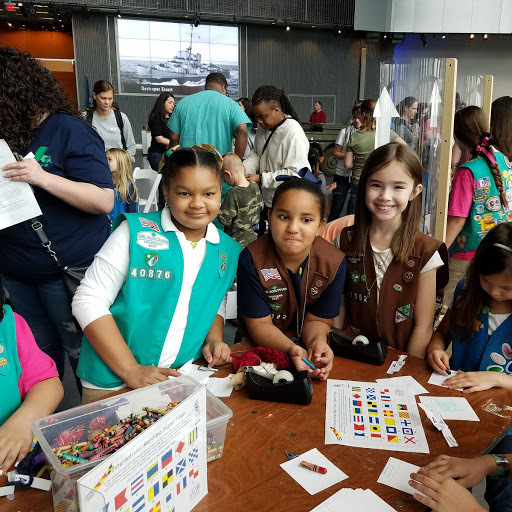 During the war years, every one’s help was needed and the Girl Scouts took their motto to heart by demonstrating the very Home Front spirit we like to highlight with this blog. 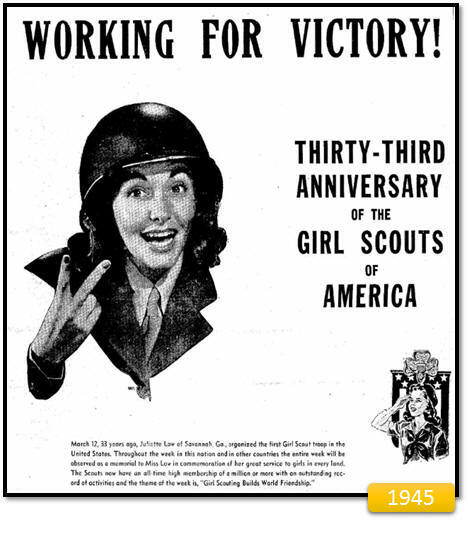 Girl Scouts were involved in helping the war effort in a variety of ways. They helped sell war bonds, tend victory gardens, and scrapped metals and fat to be reused. Girl Scouts also formed “Defense Institutes” for teaching women necessary skills and ways to comfort children during possible air raids. Troupes even made calendars instead of the Girl Scout cookies we all know and love today, so they could help with food rationing. 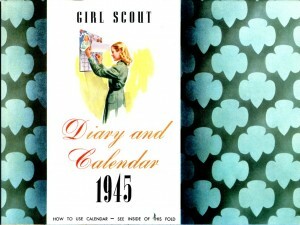 Girl Scout Calendar from 1945. Photo courtesy of the National WWII Museum collection. Inside of a Girl Scout Calendar. Photo courtesy of the National WWII Museum. Their uniform even changed its look from a dress with a zipper to one with buttons because of metal shortages. 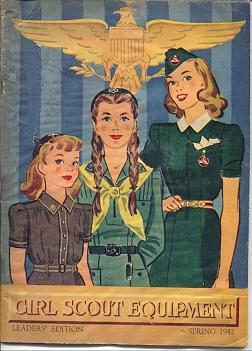 Intermediate Girl Scout Uniform style from 1938-1948. Photo courtesy of the National WWII Museum collection. 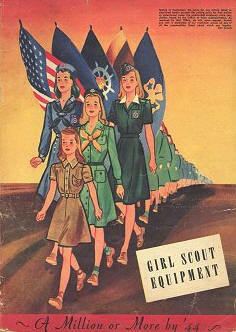 Girl Scout ads and catalog covers also had patriotic themes to them to support the war cause. Equipment catalog cover from Spring 1942. Photo courtesy of Vintage Girl Scout website. Equipment catalog cover from Fall 1943. Photo courtesy of Vintage Girl Scout website. Newspaper ad. 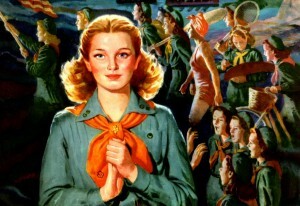 Image courtesy of Vintage Girl Scout website. The Girl Scouts kept the Home Front positive attitude alive during the war with all of these deeds and patriotism. Just as they are still keeping the same creed and way of helping people to this day. 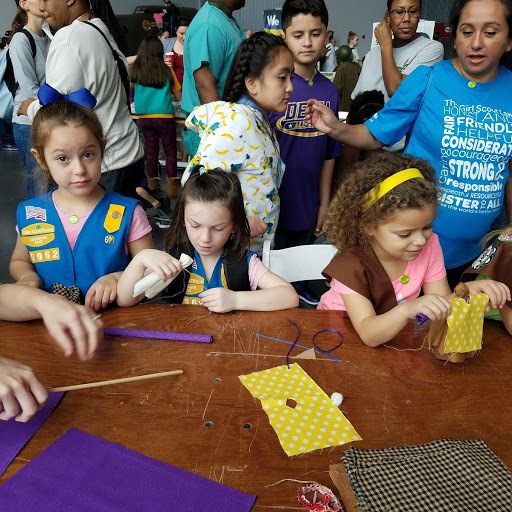 The museum celebrated National Girl Scout Day at the museum last March, where they made rag dolls with the troupes of scouts who visited the museum. Girl Scout Day at the NWWII Museum. Photo courtesy of Lauren Handley. 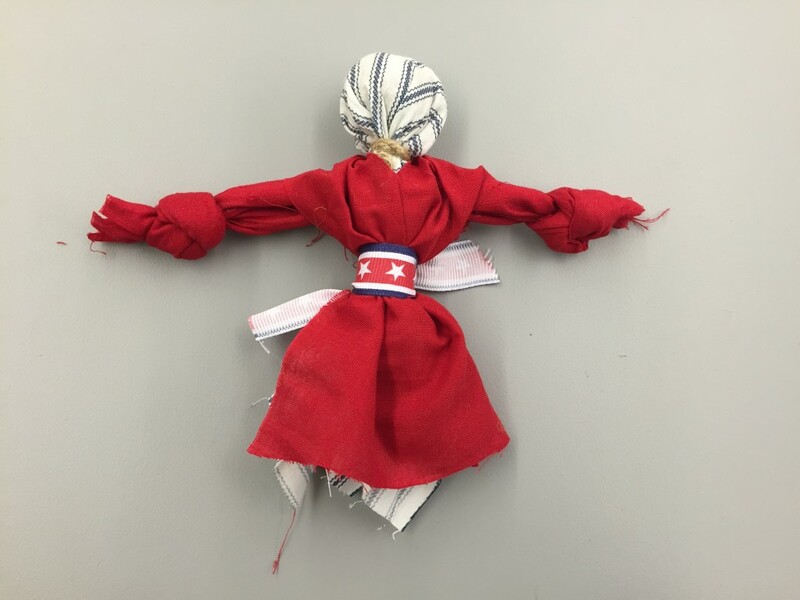 The rag doll activity incorporates some of the same ideas Girl Scouts and Americans had on the Home Front during the war by taking commonly found materials like cotton balls and scraps of fabric along with string or ribbon you have lying around and reusing them to make a doll. If you’d like to join in the fun and make a doll of your own, just follow the steps below! You can even help someone much like those Girl Scouts during the war years did by giving the doll to someone of your choosing and brightening their day. The Girl Scout slogan after all is, “Do a good turn daily” . Step 1: Place the 9×9 inch square of material facing pattern downwards. 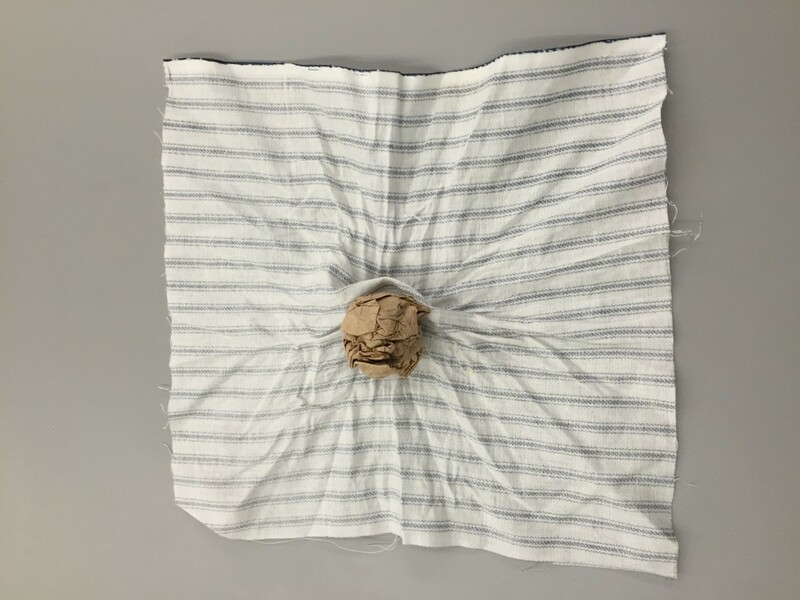 Place the TWO cotton balls into the middle of the 9×9 inch piece of material. Step 2: Wrap the material around the cotton balls to create the doll’s head and body. 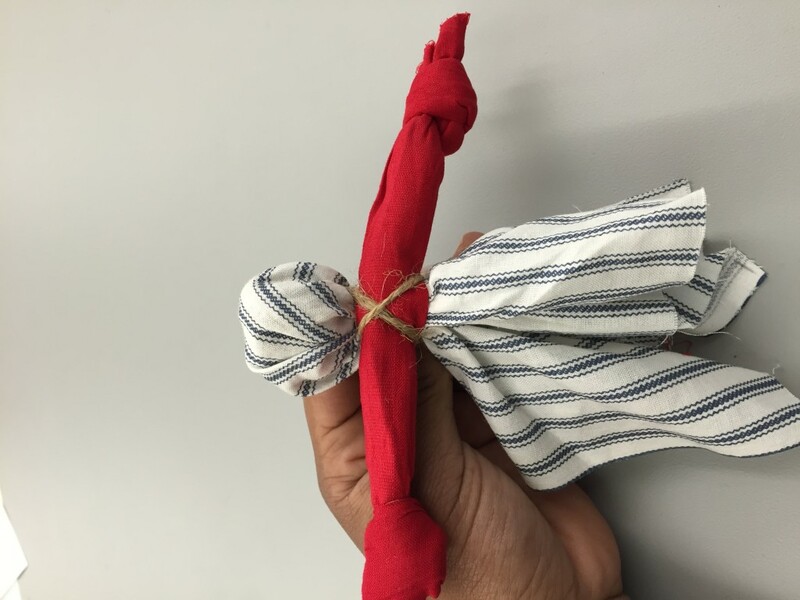 Step 3: To create the effect of a neck, twist the material beneath the doll’s head and tie a knot to hold it in place with the twine or string. Leave the ends of the string long and loose as they will be used to attach the arms. 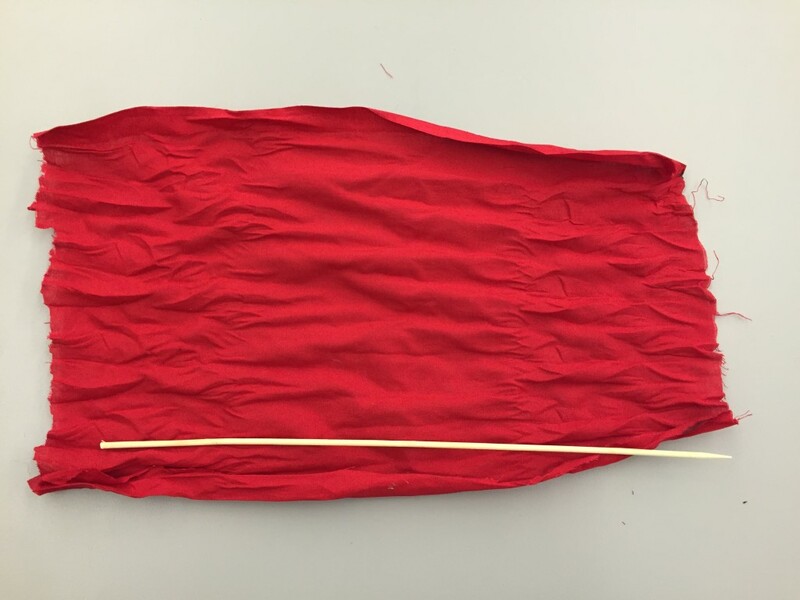 Step 4: Place the 13×9 inch rectangle of material facing pattern downwards. Step 5: Use the small dowel to roll up the material – long-ways – like a carpet. Step 6: After your material is rolled, remove the dowel. This will be your two arms. 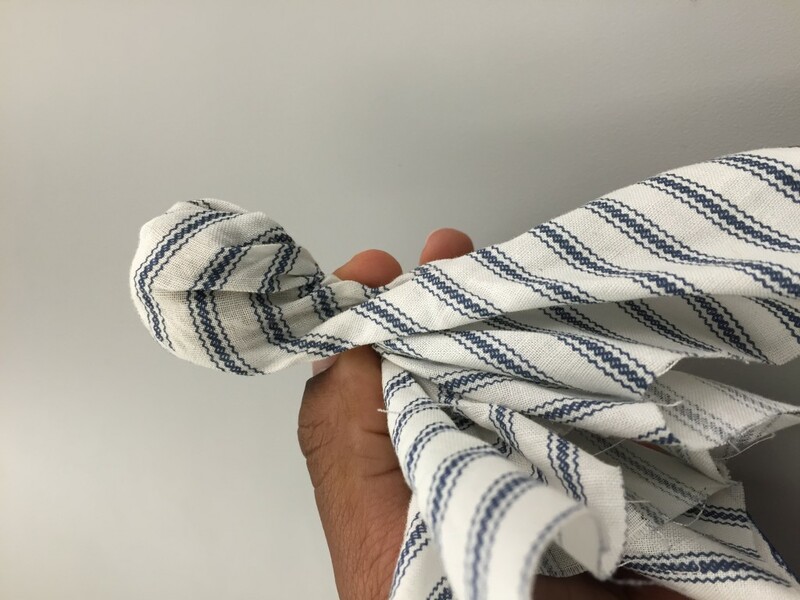 Tie a knot near each end to create hands. Step 7: Center and place the arms against the knot on the doll’s neck. 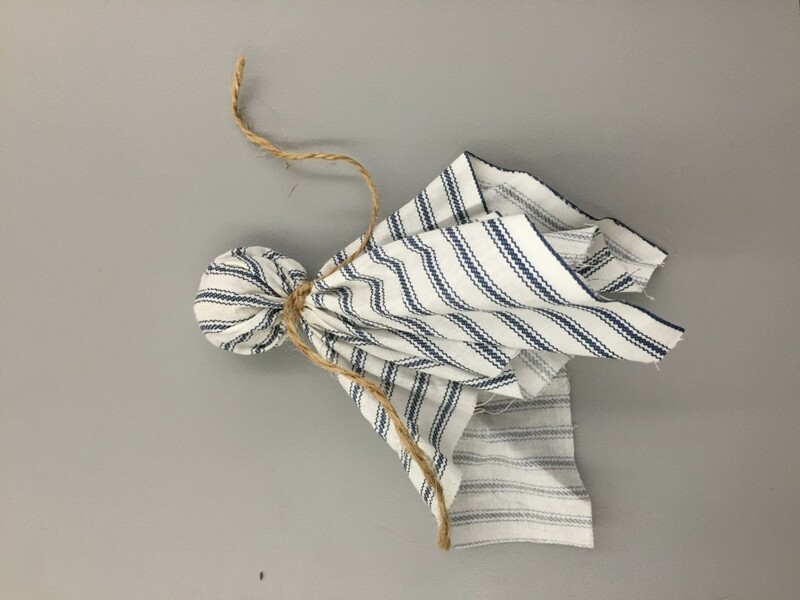 Use the two long, loose ends of twine to secure the arms in place by crossing them over the arms and across the doll’s chest like a bandolier before tying them into a knot behind the doll’s back. 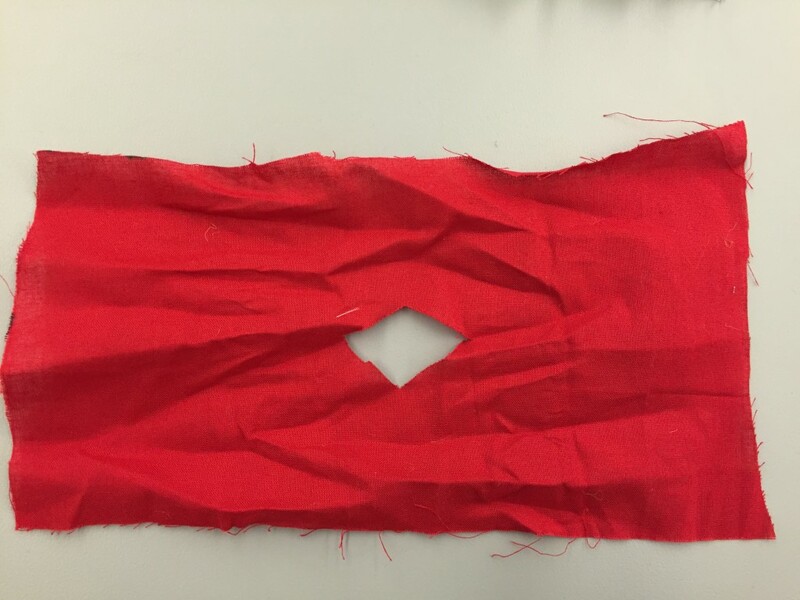 Step 8: Fold the selected 9×5 piece of material in half and snip a small triangle-shape into the middle of the seam to create a hole for the doll’s head. Step 9: Unfold the material and slip over the doll’s head. Step 10: Secure the dress/clothing in place by tying a knot around the doll’s waist using one of the lengths of ribbon. 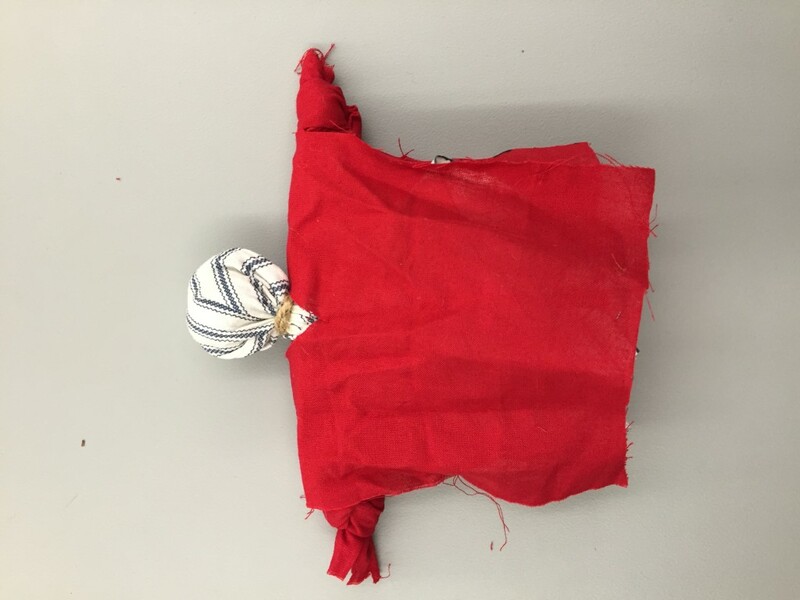 Now you’re all done with making your rag doll! Enjoy! Posted by Savannah Bamburg, Education Intern and Lauren Handley, Assistant Director of Education for Public Programs at The National WWII Museum. 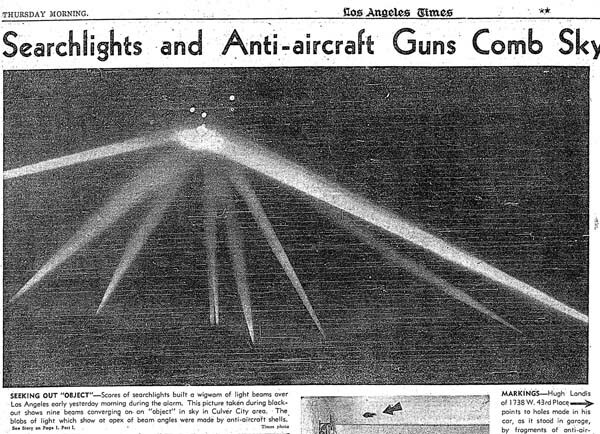 The night of February 24, 1942, and the hours before dawn of the 25th, the sky over Los Angeles was lit by search lights, the city was under a blackout, and more than 1.400 shells were shot from .50 caliber guns into the air. When the all-clear was sounded at 7:21 AM on the 25th, the only casualties were buildings and cars hit by shell fragments, and 3 civilians killed in car accidents. 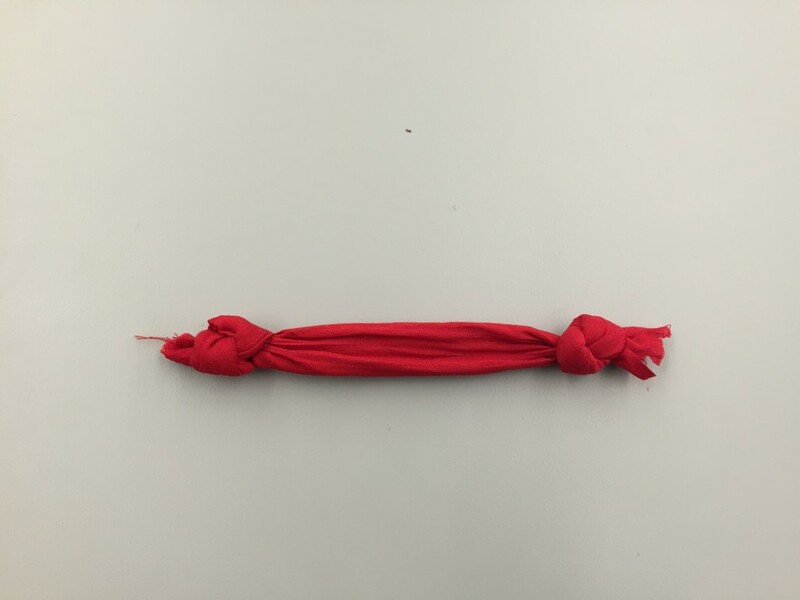 The immediate cause of the false alarm was a rogue weather balloon. When spotted from the ground by nervous watchers, lit from underneath by search lights, it was identified as an enemy aircraft. The real cause was nervousness and a heightened watchfulness that resulted from events on the previous day, a short ways up the California coast. On the evening of February 23, President Roosevelt delivered a fireside chat radio broadcast. Less than three months since the attack on Pearl Harbor, the nation was anxious, and in the midst of preparations for war. In the speech, Roosevelt said “…the broad oceans which have been heralded in the past as our protection from attack have become endless battlefields on which we are constantly being challenged by our enemies.’’ In the weeks since Pearl Harbor the United States had heard more bad news of advancing Japanese forces across the Pacific Ocean and Asia, and U-boat attacks from the German Navy in the Atlantic. 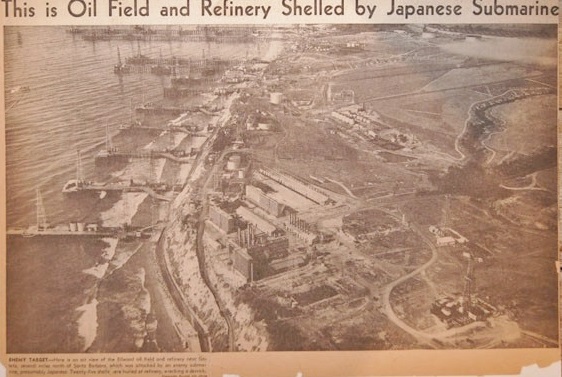 Perhaps as a means to undermine Roosevelt’s confident speech, a Japanese submarine patrolling the West Coast surfaced offshore north of Santa Barbara, and launched 13 shells towards oil wells and equipment in Ellwood, CA. It completely missed the gasoline plant there, caused minor damage to the piers and wells, and stayed 2,500 yards offshore, but the submarine’s impact on popular anxiety was great. The night of the shelling the Army Air Force sent a handful of pursuit planes and bombers to find the submarine, but was loath to commit more forces. Intelligence supplied by loyal Japanese Americans had suggested that there might be some action to disturb the President’s speech. It also suggested that Los Angeles might be attacked the next night. The state of readiness itself led to the false alarm. Confused reports from the night of the event, secrecy after it, and anxiety led to many conspiracy theories. This might even be counted as one of the first major events in the history of UFO conspiracies. Radar sightings of the objects triggering the artillery fire suggested they were moving far too slowly to have been planes. 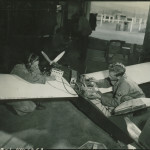 The use of radar for these purposes was new, and inexperienced operators may have been part of the problem. Visual sighting under night conditions is unreliable. Without context objects like weather balloons in the sky, especially with uncertain lighting, are difficult to scale. The event led to better coordination of civilian and military defenses on the West Coast, and to more surveillance of activities and objects around plants and other installations near the shore. It might also have contributed to popular sentiment in support of Japanese Internment. Roosevelt had authorized Executive Order 9066 just days before. 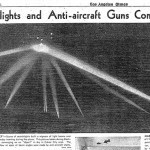 A clipping from the Los Angeles Times the day after the Battle of Los Angeles. From the Los Angeles Times. 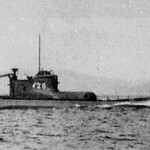 A period photo of a Japanese submarine similar to the one used in the Ellwood Bombardment. From Wikimedia Commons. 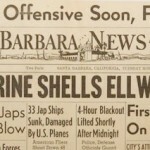 Newspaper headlines from the Santa Barbara News after the Ellwood Bombardment. 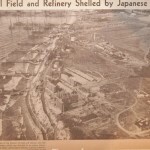 A newspaper clipping about the Ellwood Bombardment. From the Santa Barbara News. Today, TV screens are everywhere. There are several in most American homes, most restaurants and bars have them, they dominate the electronics sections of stores. During WWII, radio filled that niche in electronics and mass communication. During national elections and other big events or disasters today, we gather around televisions to find out what is happening. 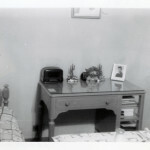 During World War II, families gathered around radios. They had their days to hear their favorite programs, as I remember Sunday nights watching nature programs on TV with my family. The technology underlying the radio and the television are basically the same. 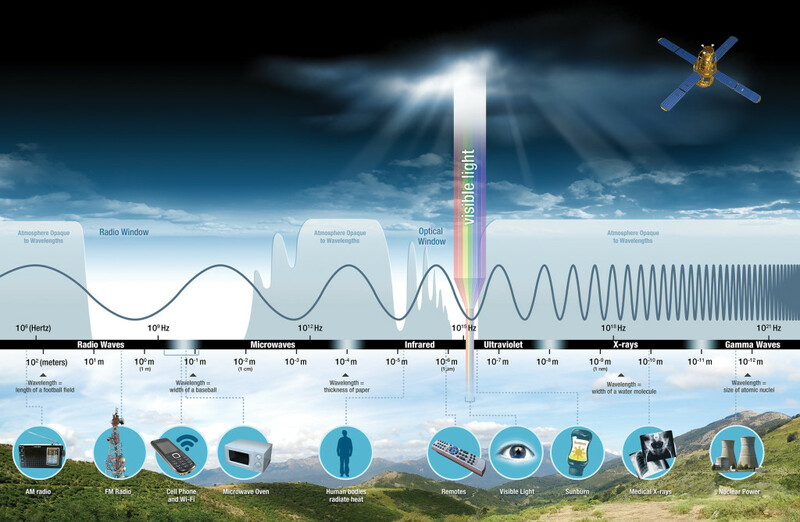 Manipulation of an electromagnetic field creates waves in a part of the electromagnetic spectrum at the transmitter. At some distance these waves are turned into an electrical current again by a receiver. In radios the receiver’s current makes a magnet attached to a paper or fabric cone move and generate sound waves. In the original televisions, the current was used in a cathode-ray tube (CRT) to make patterns on a phosphorescent screen. Today’s televisions put a current through a matrix of materials that responds to current by making different colors. The original radio waves transmitted by Marconi in the 1890s could only travel a couple of miles. Since then, engineers have developed ways to make all sorts of different electromagnetic waves. These made radio better, but also made RADAR possible, and microwaves, and x-ray machines (the first x-rays were made with radioactive material but now they use electronically generated energy). We are constantly in fields of anthropogenic electromagnetic waves. They come unintentionally from the electricity in the buildings we live in. The come intentionally from all sorts of devices. The many remote controls in a home, the cell phones, wireless phones, Wi-Fi routers, Bluetooth devices—all of these use electromagnetic waves to communicate at a distance. (As an aside, land-line phones and cable signals come into your home as electrical currents, but satellite services uses waves). Much of the consumer technology of the last century has been about finding better and better ways to harness electromagnetic waves. Amplitude modulation (AM) of waves was replaced by Frequency Modulation (FM)—although AM is still used and has its uses. Broadcasters have recently been adding HD signals, which can contain more information in waves. That’s why multiple broadcast “stations” can be received at a single frequency of waves. World War II was a huge time for the expansion of this engineering. Necessity then for portable radios drove miniaturization and vacuum-tube technology. 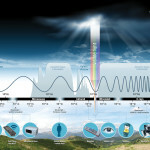 RADAR development created shorter wavelength generation. Cleaning up radio reception led to the discovery of cosmic background radiation and also led to radio astronomy. Compared to 75 years ago, the technology we use today to communicate and entertain may seem completely different. But in essence it is still the manipulation of electricity to make electromagnetic waves to be received at a distance. You can find archived radio news broadcasts from WWII here. 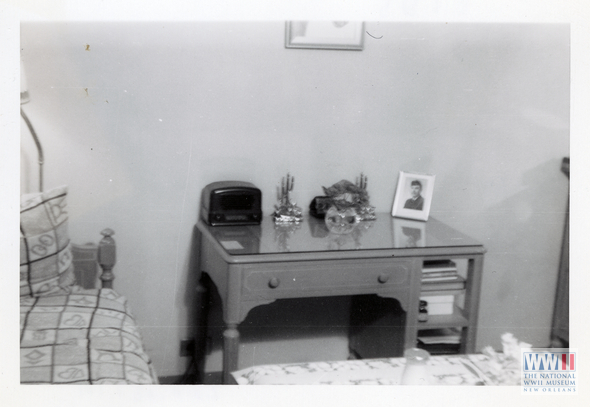 This bedside table holds a small radio next to a picture of a soldier. From the collections of the NWWII Museum. 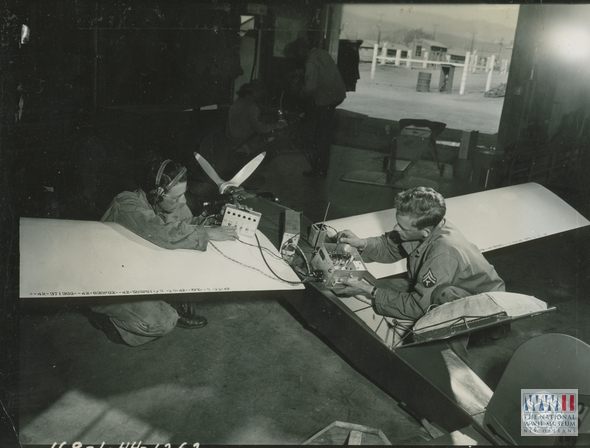 Radio-controlled drones were used for target practice during WWII. From the collections of the NWWII Museum. 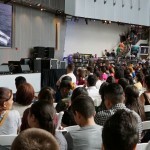 Posted by Rob Wallace, STEM Education Coordinator at The National WWII Museum.